A company accountant stole £1.7m to fund expensive holidays, shopping trips and tickets for international rugby matches, a court has heard. Gerard Lawless, 59, of Taylor's Hill, Galway in Ireland, has denied theft and fraud by abuse of position. He allegedly took the money over 11 years, mainly from two public relations companies in Harpenden, Hertfordshire. 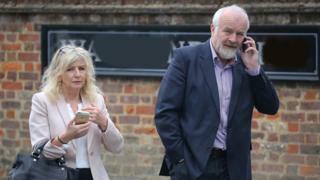 His wife, Angela, 58, denies the acquisition, retention and use or control of criminal property. St Albans Crown Court heard Mr Lawless, who previously lived in Harpenden, started working as an accountant for a small group of companies in Hertfordshire predominantly owned by Vincent Tickel in November 1997. Prosecutor Gideon Cammerman QC said he stole £1.7m between 2003 and 2014 which "supported a luxurious lifestyle". "It was spent on holidays, shopping at Selfridges, John Lewis, on family outings to international rugby games," he said. Mr Cammerman said that in a decade Mr Lawless and his wife spent £230,000 on holidays and "many thousands of pounds was spent on wine and champagne". He said: "So blatant did the fraud become that champagne for his son's wedding, to which the directors and employers were invited, was bought with a company credit card. "He would pay for a big meal on a company credit card and other people would give him money for their share back. He was giving his bank details for people to send him their share. "The money was spent not on things solely for Mr Lawless - it rarely was - it was spent on shopping, outings, meals and events." When he was confronted by Mr Tickel and others, he allegedly said: "I didn't know it was that much."